The matter of putting Paris’ famous rooftops on the hallowed list of UNESCO is on the cards, having been discussed and approved in principal at the Paris Council in early October. The person behind this initiative is the current UMP (centre-right) mayor of the 9th arrondissement Delphine Bürkli, who firmly believes in the potential of the Parisian rooftops to be blessed with a UNESCO impramatur. The rooftops in the French capital have already been a major talking point when the recently-elected Socialist mayor Anne Hidalgo announced her intention that “314 hectares of roof terraces” were to be planted with vegetables. This initiative was described by her as “one of the greatest urban revolutions that the city has ever seen” on the mayor’s campaign website. A couple of weeks ago, the people of Paris seemed to be keen to have this plan carried through when 20,000 Parisians registered for the végétalisation of the walls, making it one of the more distinctive ideas to improve the quality of life of those living in the capital. 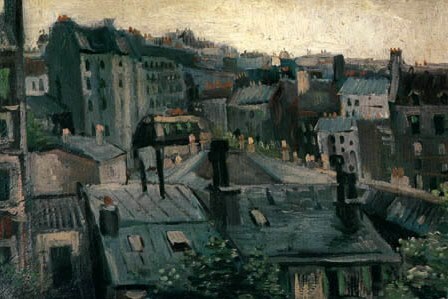 Several artists have found inspiration in the Parisian rooftops, such as the painting Vue de Paris (1886) by Vincent Van Gogh or Les Toits de Paris (1952) by Nicolas de Staël. In cinema, there were the famous shots of the Parisian rooftops in François Truffaut’s 1968 film Baisers Volés (Stolen Kisses). “For a long time, the ‘7th floor’ of the city of Paris has intrigued artists, fascinated by these roofs of zinc and slate and by their palette of many colours,” says Delphine Bürkli. It goes without saying that the roofs of Paris also have a touristic value, with the very mention of the words summoning a thousands sighs amongst romantic souls. The Georges – a bar with a spectacular view situated at the top of the Pompidou Centre – the Nüba or even more recently, the Perchoir in the Ménilmontant quarter, offer some of the best rooftop views and are all particularly popular in summer. The wish of Ms Bürkli is to continue to develop these kind of places to further boost that rooftop appeal of the City of Light. In total, there are 39 sites currently making the World Heritage Site list; the last one being the Grotte Chauvet last June.